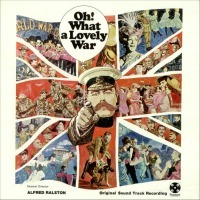 Film Soundtrack, 1969 (Paramount/no CD) (2 / 5) Directed by Richard Attenborough, the film version of Oh! 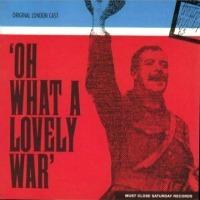 What a Lovely War found its own way to interpret the kaleidoscope of scenes and songs from the dazzling stage show. Unlike the London cast album, which includes a lot of dialogue, the soundtrack LP has only the songs. Some of them are given big, Hollywood-style orchestrations, others are arranged and performed more atmospherically, and there are also some medleys and instrumental tracks. “Belgium Put the Kibosh on the Kaiser” is charmingly sung by Jean-Pierre Cassel. In a recruiting sequence, Peggy Allen lends her bland soprano to “We Don’t Want to Lose You,” but then Maggie Smith takes over and grabs our attention with “I’ll Make a Man of You.” Smith has a commanding belt that will surprise listeners; her performance alone makes the soundtrack album noteworthy. Most of the other singing is lacking in personality, and because the songs are heard completely out of context, they aren’t as heartbreaking as they are on the stage cast album. — J.D.